Homemade gnocchi is about one of my world’s most favorite things. I. Love. Gnocchi. Especially when it’s done well. Meaning light and fluffy, rather than dense and chewy. While making your own gnocchi is not especially difficult, it is a little bit time consuming. At my house, it’s reserved for the weekend. Typically, late enough in the day to make with a glass of wine hanging around. Given the nature of the process (something a little bit delicate) and the time it involves, gnocchi is not something to make from scratch if you don’t love it. If you think gnocchi is just okay, you will not love making it by hand. I used sweet potatoes, because while it may not feel like it, fall is upon us. 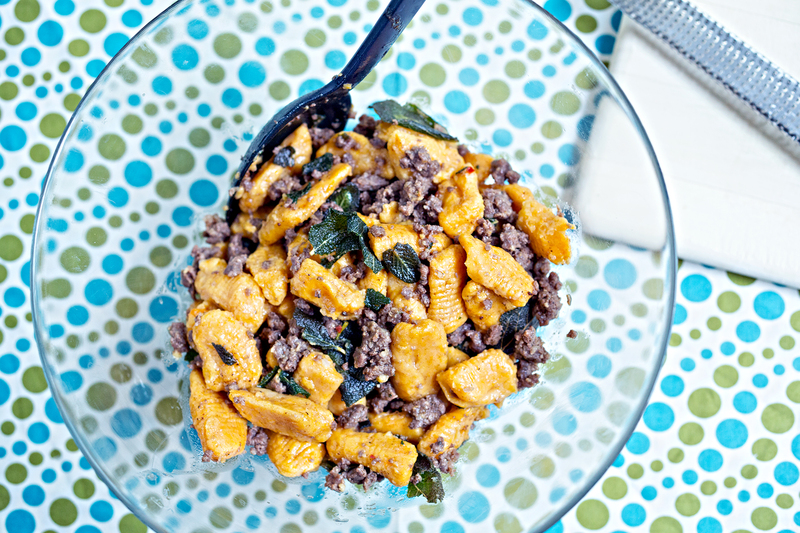 Sweet potatoes also go really well with sage, which is what I had in store for my gnocchi. I made a double batch so I could freeze half for later. If you want to freeze your gnocchi, freeze it first in one layer on a tray lined with parchment or wax paper, then toss it in your ziplock or Tupperware. Otherwise, it will all stick together in one big block. As far as the making of the gnocchi, there really isn’t much to it except to try not to over work it. I bought a gnocchi paddle but it’s not necessary. You can always roll them on the tines of a fork. Either way, when making the ridges you can push on the pieces kind of hard until it rolls right off either the fork or the paddle. When deciding how to dress your gnocchi (because gnocchi loves fancy clothes), it’s all up to you! I like using browned butter because that is also one of my world’s most favorite thing. You can, however, do whatever strikes your fancy. Try a little melted (but not browned) butter and lemon with fresh veggies, or even your favorite rendition of a red sauce (though I think that goes much better with plain potato gnocchi). Poke holes in the sweet and russet potatoes and microwave on high until soft, about 5-10 minutes. The russet potato will take longer. Cut in half, scoop out the flesh (discarding the skins) and either run through a ricer or mash with a fork or potato masher. Once cool enough mix with your hands, add the egg, cheese, pepper and salt to taste. Mix well. Add the flour 1/2 cup at a time. Keep adding flour until the dough is wet but not sticky. Break off about 1 cup chunks of dough and roll into about a 1/2 inch rope on a floured surface. (Don't use too much flour though - just enough to keep it from sticking otherwise the gnocchi will get heavy). 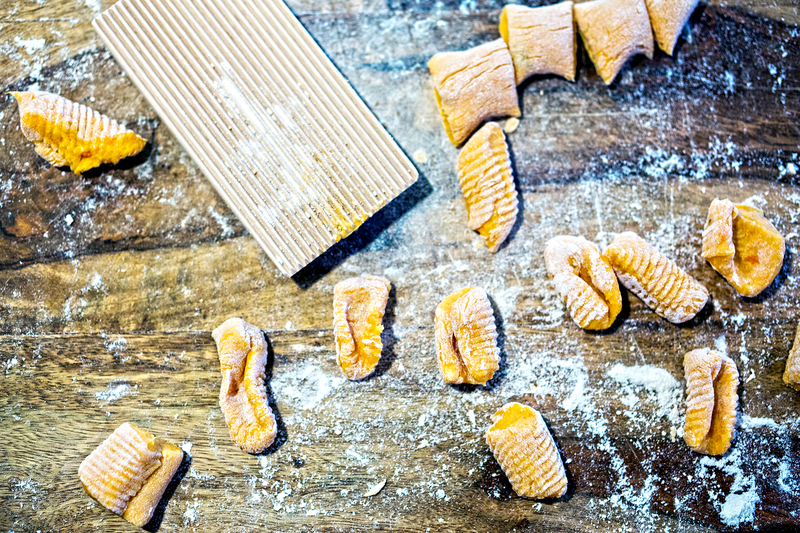 Cut the ropes into 1-inch pieces and roll on either a gnocchi paddle or the tines of a fork. At this point, the gnocchi can be frozen for later use or made 4 hours ahead of time. Heat a large stock pot full of water and bring to a boil. Drop in about 1/3 of the gnocchi. Once they float, continue to boil for about 30 seconds if fresh (60 seconds if frozen) and remove with a slotted spoon or sieve. Repeat with the rest of the gnocchi, working about 1/3 of the batch at a time. Set aside in a large pasta bowl. Melt the butter in a saucepan over medium heat and continue to cook until it turns dark brown. Once done, drizzle over the reserved gnocchi. Meanwhile, heat a pan over medium-high heat. Brown the sausage, letting some of the smaller bits get crispy. Remove to the bowl with the gnocchi and butter. Then, fry the sage leaves in the sausage fat until they get crispy and add that to the bowl as well. 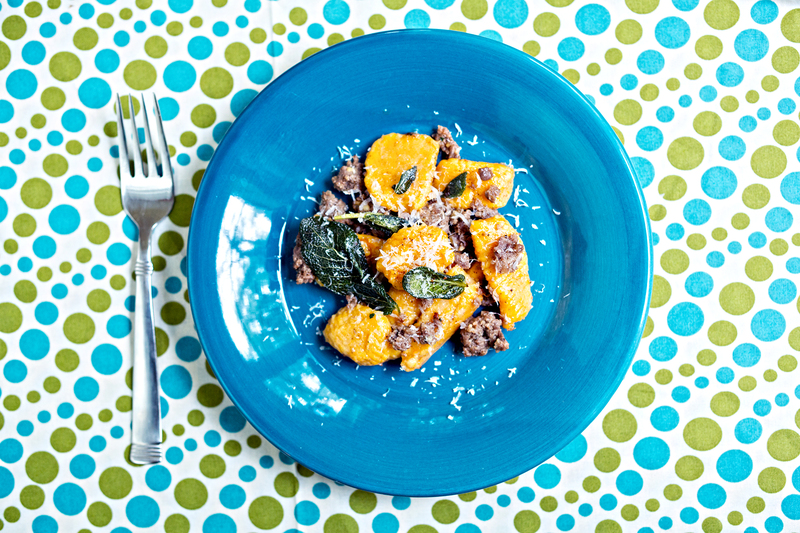 Very gently toss the gnocchi, sausage, sage leaves and browned butter until everything is incorporated. Add a little of the sausage fat if it looks like you need a little more moisture in the mixture. Serve warm and garnish with grated parmesan. Non-game substitution: Any casing free sausage would go well with this dish, as long as the spices will blend with the sage. Vegetarian Substitution: Just leave off the sausage! Browned butter and sage is delicious on its own. 2 Comments on "A labor of love"
Made this tonight and it’s pretty tasty! Quite filling. Mine didn’t turn out quite as pretty, but I will certainly put it into the venison recipe rotation! Awesome, glad you liked it! It’s always a challenge getting them to look right. The last few are always prettier.